UFC strawweight Justine Kish experienced one of those moments that every fighter thinks about but hopes never happens while in competition. Last night while fighting Felice Herrig on the main card of UFC Fight Night 112 from Oklahoma City, Kish was working to escape a very tight submission attempt by Herrig when she accidentally relieved herself. Fans immediately took to social media questioning whether or not Kish had actually pooped herself or not. Some insisted it was blood from earlier in the night. How could she have pooped herself but not visibly have it anywhere on her body? She seemed to be safe. 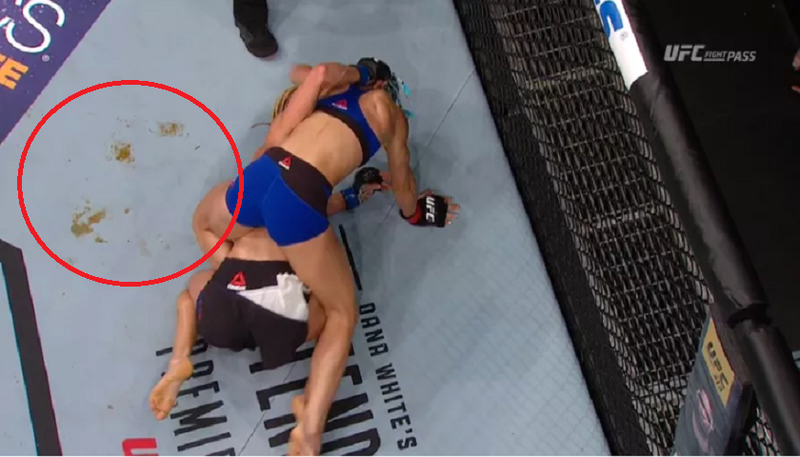 That is until members of the media confirmed that it was indeed poop and that it had to be cleaned before the co-main event of Johny Hendricks vs. Tim Boetsch. It was. The guy who cleaned it up showed us pictures here on press row.